China’s three major telecom operators have released 2017 interim results report on the first half of this year on August 23rd. They recorded an average daily net profit of about 429 million RMB ($64.3 million), which China Mobile accounted for 80% of them, Chinese media iFeng is reporting (in Chinese). In terms of 4G development, China Mobile (中国移动) outshines the market in both the number of users and the net increase of the users. In the fixed-line broadband, China Telecom (中国电信) still triumphs over the two players, but China Mobile is growing its users base with fierce momentum. In terms of net profit, China Mobile is far ahead of the others: China Mobile recorded a net profit of 62.7 billion RMB, an increase of 3.5%, 4 times bigger than the combined net profit of China Telecom and China Unicom (中国联通). China Mobile’s profitability is 5 times that of China Telecom and 26 times that of China Unicom. This means that China Mobile daily earn 348 million in less than a week, and what China Mobile earned in 7 days equals to what China Unicom earned in six months. 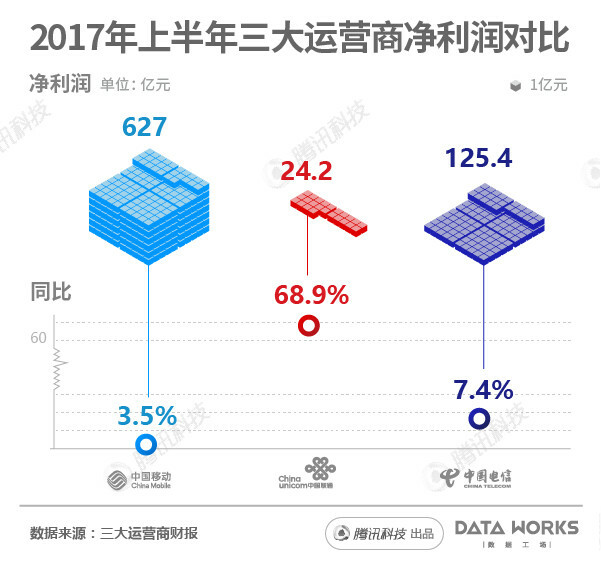 From the 4G market share, China Mobile is still the largest, with its 4G users reaching 594 million, while China Unicom and China Telecom only take 23.4% and 25.6%, respectively, of the market. 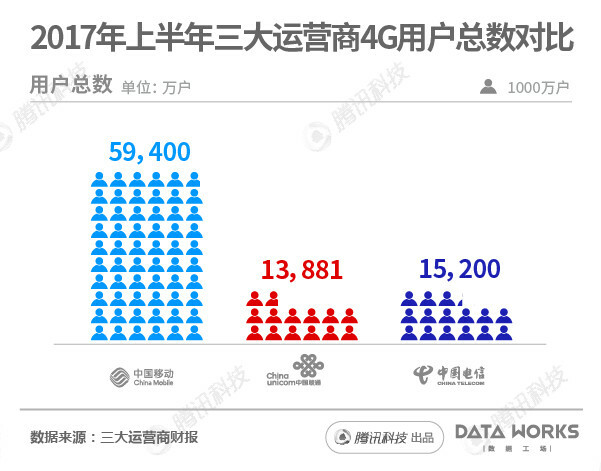 From the growth point of view, China Telecom’s 4G users are the fastest growing, with its total number of users has outnumbering that of China Unicom. 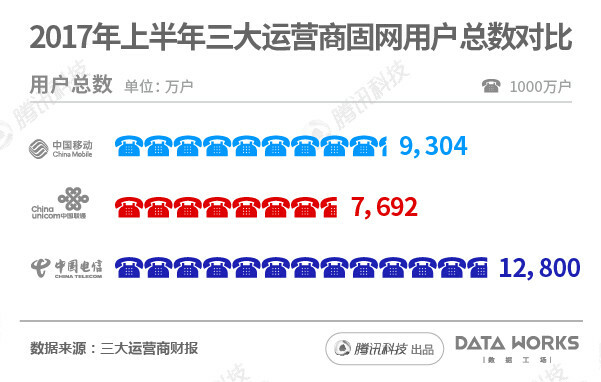 In the fixed-line broadband development, China Telecom still maintains to be the Big Brother. In the first half of this year, China Telecom’s cable broadband subscribers reached 128 million, a year-on-year increase of 4.98 million, of which fiber-optic broadband (FTTH) subscribers reached 117 million, a net increase of 11.24 million over the end of last year. China Mobile is the second biggest player, with its mobile fixed-line customers showing a net increase of 15.42 million, reaching 93.04 million users, is expected that its cable broadband customers will exceed 100 million by the end of this year. In 5G development, the three major telecom operators are launching field experiment and putting R&D efforts. China Unicom said in the interim report, that the company is launching 5G network field test in cities, and is jointly developing 5G applications and solutions with its partners. China Mobile launched a 5G field experiment this year and said it will start the construction of mobile networking, to speed up the SDN and Network Function Virtualization (NFV) to bring the next generation of cloud network transformation in 346 cities in China. China Telecom announced that the company 5G network field test in 6 cities. China Unicom is falling behind in almost all the race: net profit, 4G development, and fixed-line broadband development. As Chinese tech giants Alibaba, Baidu, Tencent, JD acquired shares in China Unicom and has been cooperating with BAT since October last year, we’ll have to observe how China Unicom further develops.